Queen duvet cover (88" x 88") featuring the image "Rusty Land" by Barbara McMahon. Our soft microfiber duvet covers are hand sewn and include a hidden zipper for easy washing and assembly. Your selected image is printed on the top surface with a soft white surface underneath. All duvet covers are machine washable with cold water and a mild detergent. Thank you Johnstons for featuring "Rusty Land" in USA Artist's News! Much appreciated! Thank you Sherry. 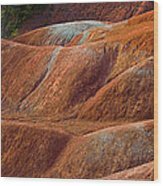 The Badlands is a hauntingly beautiful landscape. Thank you so much Paul. Yesterday was the first time I had visited the Badlands. The landscape literally excited me also. If had worn a space suit I could have planted myself as an astronaut, so desolate was the terrain. 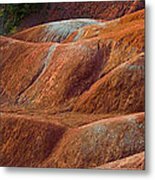 Cheltenham Badlands is a small example of badlands formation in Caledon, Ontario. Located within the Niagara Escarpment, the site is by default part of the local UNESCO World Biosphere Reserve The formation was exposed by poor farming practices in the 1930s that led to soil erosion and exposed the underlying shale. 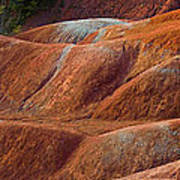 The formation is mostly red in colour due to iron oxide deposits with some faint green streaks due to ground water percolation changing the red iron oxide into green iron oxide. Thank you for viewing. Barbara McMahon Featured in "USA Artist's News"